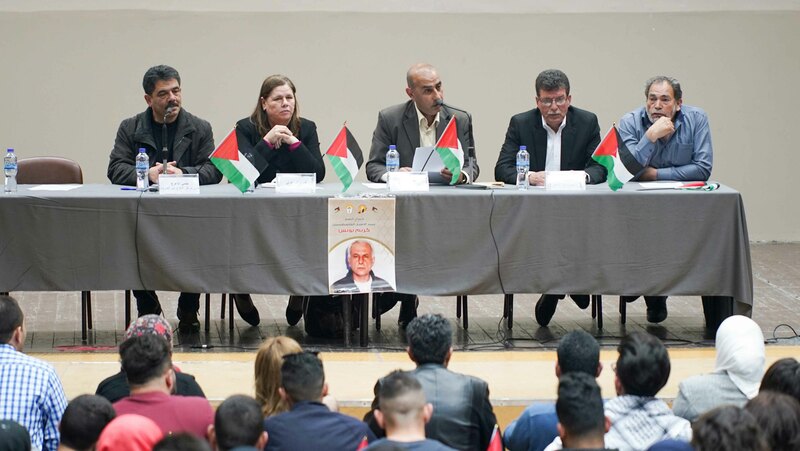 Political activists, academics and released prisoners discussed the open-ended hunger strike that will be held by the Palestinian political prisoners on April 17. 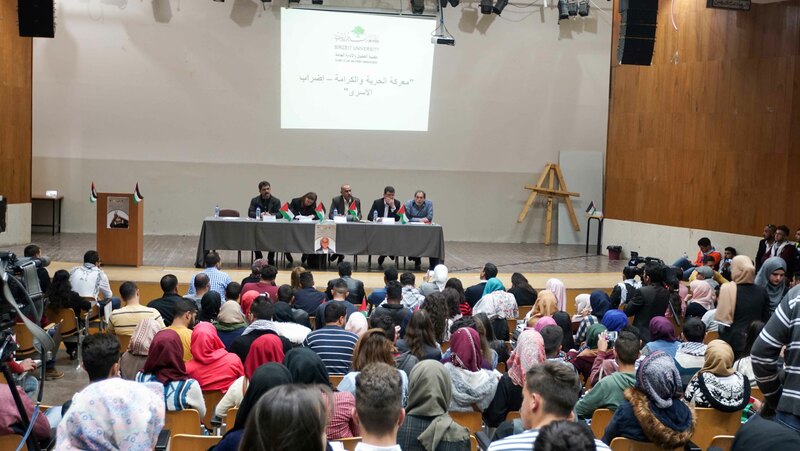 The lecture was organized by the Department of Political Science at Birzeit University on April 13, 2017. Professor of Political Science Imad Gayatha talked about the societal role in supporting the prisoners cause, alluding to the importance and motivations of the hunger strike, and its consequences on the Palestinian cause in general. The Dean of the Faculty of Law and Public Administration Yasser Amouri reaffirmed the university’s mission in supporting the long and hard journey of prisoners. Hurriyyat director Hilmi Al-Araj said that this open-ended hunger strike aims to press for the prisoners basic rights, and shed light on the difficult humanitarian conditions inside the Israeli Occupation’s prisons. The occupation, according to Al-Araj, is unsuccessfully trying to break the will and determination of the prisoner. “Our responsibility, as Palestinians, is to support their battle. Let us all push for the popular and official movement to stand by the prisoners in this critical time”, he commented. The head of the Palestinian Prisoners club Qadura Fares said that hunger strike is one of the means that is used in resisting the enemy. Qadoura assured the Palestinian Prisoners’ Movement was able to reconstitute an internal structure and develop regular and factional frameworks inside the prison, to serve all the prisoners’ goal. Former prisoner Fakhri Barghoti told the audience that this battle is one of the most dangerous and difficult decisions. However, the prisoners are determinate to move on in this battle because the conditions inside the prisons have reached a new low.